Everything old is new again in FLCL’s return, but guitars as weapons of mass destruction are forever. After almost a year of waiting, we finally know when to expect Adult Swim’s new continuations of Gainax’s beloved, weird-as-hell coming of age anime FLCL—and we’re getting a double dose of it this year, to boot. Adult Swim released a new trailer acting as a mishmash of both the new second and third seasons of the show, now dubbed FLCL: Progressive and FLCL: Alternative, respectively. Both are set after the events of the original series: Progressive follows two teenage classmates, Hidomi and Ide, who find themselves on the front lines of another battle with the Medical Mechanica as two new “otherworldly beings” named Jinyu and Haruha look to unlock their potentials in the way the bass guitar-wielding alien Haruko did with FLCL’s original protagonist, Naota. Although it’s not been announced, there’s been a few hints Haruko will also show up at some point. 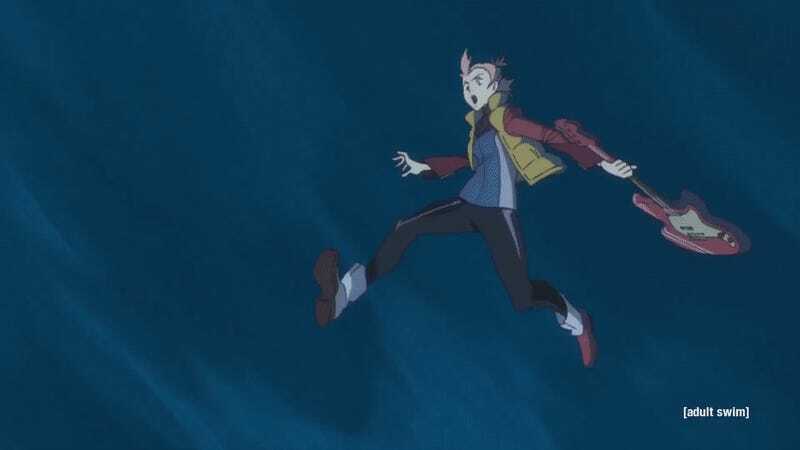 It still feels weird to be seeing new FLCL stories in 2018, especially ones that are going to have a tough time matching the wild ride of the original series. But they’re looking intriguing so far, and like I said, more music by the Pillows in our lives can at the very least be a good thing. FLCL: Progressive airs this June on Adult Swim, with FLCL: Alternative following up in September.